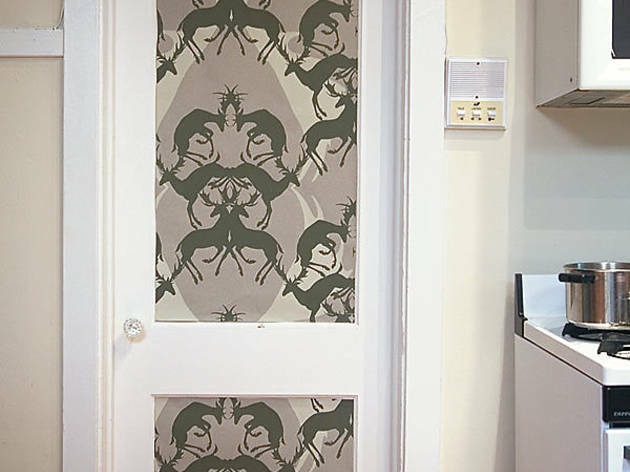 Paint, er, paper your place pretty with creative wallpaper solutions. Choose a door and cover the recessed panel. In addition to looking pretty, it will protect the edges. Sure, your books look pretty on their own, but you can doll up their home by applying paper on the back of a closed bookshelf or on the wall behind an open case. If you don’t already have a headboard, create a faux version by applying a section of paper behind the bed. Dress it up with a wood trim. On a technical note: You’ll need to treat the surface where you apply the paper with a primer, then use a paste—clear, heavy-weight clay or prepasted activator, depending on the type of paper—to adhere it. Remove with hot water or an enzyme solution, such as Dif.